There might be names on your list with no address e.g. a work colleague, or close family member. You can still print their name to a label, but often you would not want to do this. If you just want to print labels where the name has an address, then set the Print Names even if address missing switch to OFF. It is likely that most of your cards will be within your own country. In this case, it is unlikely that you will want to print the country, as part of the address. 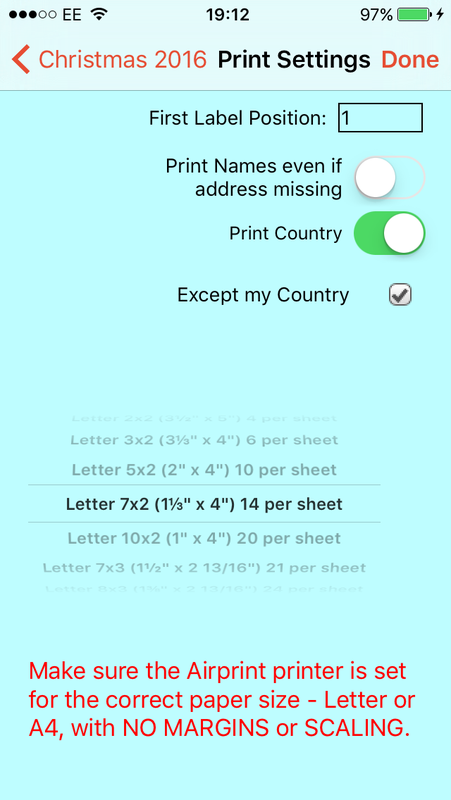 If you set the Print Country switch to OFF, then no Countries will get printed (whether it is to someone in your own country or overseas). If The Print Country switch is ON, then overseas addresses will have the Country printed. If you have checked the Except my Country (as above), then addresses within your own country will not have the Country on the address. Note: this applies only to names and addresses which came from Contacts, where the app gets the Country field from the Contacts app. If the addresses was typed manually, the app has no way of knowing what each part of the address is, and so will display the address just as the person has typed it. You can set the Maximum Font Size to limit the text size on the labels. The app tries to make the text as large as it can, but still fit on the label. This meant that on large labels, e.g. maybe 4 on a sheet, the text was huge. This setting allows you to limit that text size.